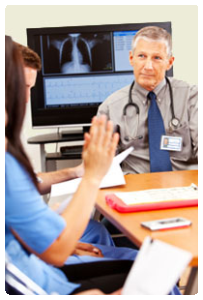 Our staff is comprised of an interdisciplinary team of doctors, therapists, nurse practitioners, licensed practical nurses, registered nurses, certified nursing assistants, social workers, registered dietitian, and a support staff trained to perform the highest quality of skilled nursing care with compassion and sensitivity. Each staff member has been carefully selected on the basis of experience, competence, and, most of all, their desire to exhibit a supportive attitude and provide quality care to all our residents. We consider our facility to be unique and are proud of the dedication our staff shows to all residents and their family members who are faced with limitations and challenges. Upon arrival, each resident receives a thorough evaluation to determine his or her physical and emotional needs and their learning style. Our staff of doctors, nurses, a registered dietitian, and social workers will then collaborate with the patient and his or her family to develop an individualized care plan to maintain and/or improve the quality of life. By utilizing a team approach, combining a group of experienced professionals with the resident and family, we are able to design a care plan to offer the resident the best opportunity for a successful outcome. 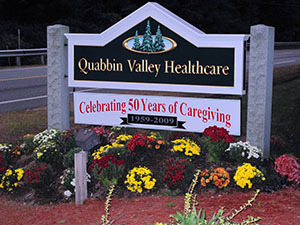 The unwavering dedication of our administration, staff, and volunteers has helped make Quabbin Valley Healthcare one of the finest skilled nursing and rehabilitation centers in Massachusetts. For more information about our programs and services, please contact our admissions director. She will be happy to speak with you, answer your questions, and arrange to give you a personal tour of our facility. Please send us your contact information by using the form below. Our admissions director will be in touch with you within 24hours to discuss a convenient time for you to visit our facility!